Director Mithran Jawahar has revealed that though Uthama Puthiran is gearing up for a Diwali release this year, no one has seen the final product yet. 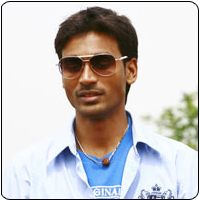 He adds that not even the film’s hero Dhanush has had a peek at the film till date, which is unbelievable. UP is a remake of the Telugu film Ready but the director claims to have retained only primary plot and Genelia, who played the lead role the original version, while he has changed everything else to suit the Tamil audience.